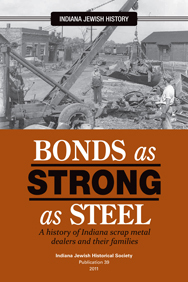 The Indiana Jewish Historical Society, with the assistance of the Indiana Center on Philanthropy, conducted research on the scrap dealers of Indiana. The scope of this project included the scrap dealers’ businesses and families and their impact on communities. The Society attempted to contact as many current and former scrap dealers as possible in order to record their family, business, and philanthropic histories. The Society was prompted to undertake this project at this time because of a sense of urgency. Many of the scrap dealers who were interviewed are a third or fourth generation removed from the original founders, and many of them are advanced in age. Interviews were conducted in person whenever possible. To reach families who have moved, the interviewer, Erin Hamilton, used phone calls, e-mail, and U.S. Mail to gather information. The questions were developed with help from a variety of sources, including one or two people from the scrap industry, and one or two people who have experience in historical research.